Its early A.M. on Thursday 20th June 2013 and in 2 days time the 2013 Nexus Conference will begin. (see previous post for more details or go to our Facebook Page). Cam and I will be there at our stall. We are there as CSETI's Australian Point-of-Contact for when Dr Steven M Greer speaks via Skype; and also to promote C.D.R.G. (Australia). If you are attending the conference, please seek us out and say hi, share your experiences and have a chat. We will be posting the last 2 Global CE-5 ET Contact Event reports soon (May and June 2013) ... We actually have heaps more to post from past events, etc. Since the SIRIUS Documentary showed, we have been so very busy (hence, that is why I'm still typing at 12:57am); And due to all of this, it has allowed C.D.R.G. 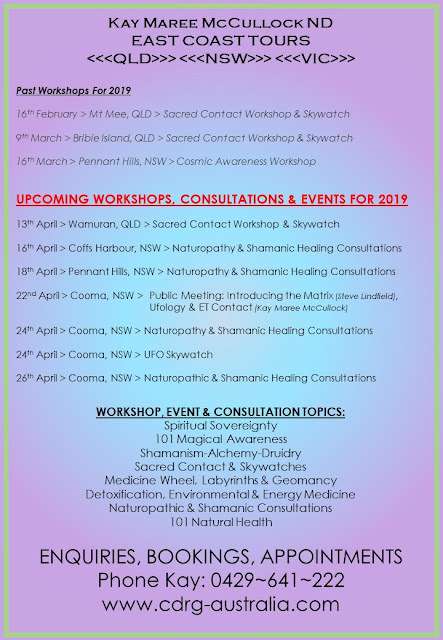 (Australia) to evolve and transform by introducing more regular Events, Gatherings and Trainings (go to Events, Gatherings and Trainings for more info). Also a HUGE Thanks to UFO Research Queensland Inc, for having us at their monthly meetings to discuss all these wonderful topics and promoting us. Also, if you have texted, phoned or emailed us, and we haven't got back to you yet, we will after next Tuesday, after the Nexus Conference is complete. So, we havent been ignoring you and haven't forgotten about you.